Apple has revamped its iMac and Mac mini consumer desktop lines. The new Mac mini gets improved graphics capabilities, moving to Nvidia integrated graphics, while the iMac gets expanded memory and storage--up to 1 TB in a base configuration--and new pricing. The new Mac mini adds Nvidia GeForce 9400M integrated graphics and is now available in two configurations. The lower-end model comes with a 2.0 GHz Intel Core 2 Duo processor with 3 MB shared L2 cache, 1 GB of 1,066 MHz DDR3 SDRAM expandable up to 4 GB, and a 120 GB SATA hard drive running at 5,400 RPM. It sells for $599. The higher-end model comes with a 2.0 GHz Intel Core 2 Duo processor with 3 MB shared L2 cache, 2 GB of 1,066 MHz DDR3 SDRAM expandable up to 4 GB, and a 320 GB SATA hard drive running at 5,400 RPM. It sells for $799. The new iMac lineup now includes four base configurations: one 20-inch model and four 24-inch models. The $1,199 20-inch model comes with a 2.66 GHz Intel Core 2 Duo processor, 2 GB of 1,066 MHz DDR3 memory, a 320GB Serial ATA hard drive and Nvidia GeForce 9400M integrated graphics.It includes 2 GB 1,066 MHz DDR3 SDRAM (expandable to 8GB). The 24-inch iMac now starts at $1,499 and comes in three configurations, differentiated by graphics capabilities, base storage, and processor speeds. The $1,499 model includes a 2.66 GHz Intel Core 2 Duo processor with 6 MB shared L2 cache; a 640 GB, 7,200 RPM internal SATA drive; and Nvidia GeForce 9400M integrated graphics. The $1,799 model includes a 2.93 GHz Intel Core 2 Duo processor with 6 MB shared L2 cache; a 640 GB, 7,200 RPM internal SATA drive; and Nvidia GeForce GeForce GT 120 with 256 MB GDDR3 SDRAM. And the $2,199 model includes a 3.06 GHz Intel Core 2 Duo processor with 6 MB shared L2 cache; a 1 terabyte, 7,200 RPM internal SATA drive; and Nvidia GeForce GeForce GT 130 with 512 MB GDDR3 SDRAM. 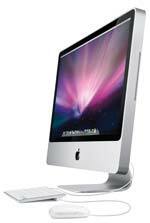 All of the 24-inch models come with 4 GB of 1,066 MHz DDR3 SDRAM (expandable to 8 GB). Optical/analog combo audio I/O, along with a built-in mic and speakers. The new Mac mini and iMac models are available now. Further information can be found here.